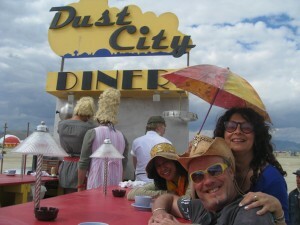 The yummiest grilled cheese sandwiches on earth are served at the Dust City Diner at Burning Man. I love these people! It’s a truck that moves all around the desert. During the time I was there, they usually setup near a big art installation. So the first night, we saw them in front of the Temple. One day, I saw it parked right by the Man. This picture has them situated smack dab in front of the ARTery. Doesn’t get better than that! If I recall correctly, there are stools for eight people. They serve coffee, tea, and gratifying grilled cheese. They’re all dressed up in 50s server outfits with tall blonde wigs. Checkout the lamps and the ashtrays. That’s an eye for detail! And look at the smiles on our faces. We are cheesy happy!